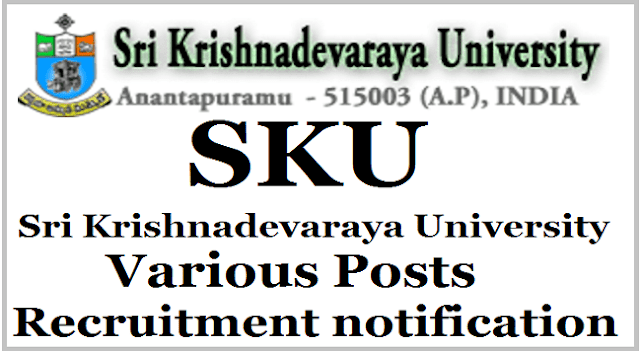 SKU /Sri Krishnadevaraya University Non Teaching Posts Recruitment Apply before 15/04/2017: Sri Krishnadevaraya University Recruitment, SKU Non-Teaching and Hostels Vacancies Recruitment. SK University Special Recruitment for SC/ST Backlog Vacancies notification: Applications in the prescribed form are invited from the Eligible candidates (SC,ST and PH Category) for the Non-Teaching and SKU Hostels Backlog Vacancy Posts S.K.University, Ananthapuramu on Special Recruitment. The details pertaining to Backlog Vacancies of Non-Teaching and Hostels Vacancies and the application form/eligibility criteria and other information may be obtained at University website: www.skuniversity.org. The University reserves the right to increase/decrease or cancel the above appointments at any point of time without prior notice. Qualifications: Bachelor Degree in Arts/Commerce/Science from a Recognized University with Type writing Lower Grade in English / Telugu with Computer Knowledge. Qualifications: Bachelor Degree in Arts/Commerce/Science from a Recognized University. Qualifications: 7th Class passed with 2 years experience in Cooking. Qualifications: A Pass in Matriculation or S.S.C examination with eligibility for University Courses of Study and with a certificate in Library Science from a Recognized University preferable with two years experience of work in a Library. c) Experience in Fabrication and repair laboratory instruments/Computer Programming in Additional Qualification. Qualifications : Must have passed ITI in concerned trade and shall have 3 years experience in the post of Assistant r an equivalent service in pump installations and repairs to pump machinery, provided that the required experience may be reduced to 2 years in respect of candidates who have undergone satisfactory course in Mechanical Engineering in a Govt. institution or any other institution. 7th Class passed with 2 years experience in water works. Qualifications: SSC passed 2. Diploma in Telephone Operating. Qualifications : A Literate in English or Telugu with heavy driving License. Age (for all the posts) should be not less than 18 years but not more than 34 years. Age Relaxation (for all the posts) The upper age limit is relaxed with 10 years (i.e. Mode of Payment Amount shall be paid by means of Demand Draft of in favour of the Registrar, Sri Krishnadevaraya University payable at Ananthapurmau. University for attending the interview. Last Date The filled in application along with all necessary enclosures, Demand Draft towards should reach on or before 15.04.2017 upto 5.00 p.m. Further the application shall be accompanied with an envelope affixing postal stamp worth of Rs.40/- for sending the call letter by post to attend the interview. The University reserves the right to fill or not to fill the above vacancies without assigning any reasons therefore.